« Are you good at hammocks? A lot of camps use services that allow parents to email letters to the camp that get printed out and delivered to their child. The child writes a response, which gets printed out, scanned and sent back to the parents electronically. I see this service as a double-edged sword. On the one hand, it’s immediate gratification. And on the other, it’s immediate gratification. My boys go to a camp that still relies only on the U.S. postal system. They fly there, and they keep their phones until they arrive at camp. On the bus from the airport to camp this year, one of my sons got some news he wasn’t happy about. And so he texted me. I had already said my goodbyes and started the mental shift to letting him fend for himself for the next four weeks. His texts made it clear that his spirits were sinking, so I tried to help. But I was relieved to know that within a few hours he’d be arriving at camp and would have to part with his phone, and so with me. Part of going away to camp is learning to be self-reliant. If a phone and the ability to text home is always at hand, it will inevitably be leaned on. When you’re unhappy and you send a text or an email, you wait for an answer. When you write a letter that you know will take days to arrive, you’re more likely to just get down to the business of soothing yourself. 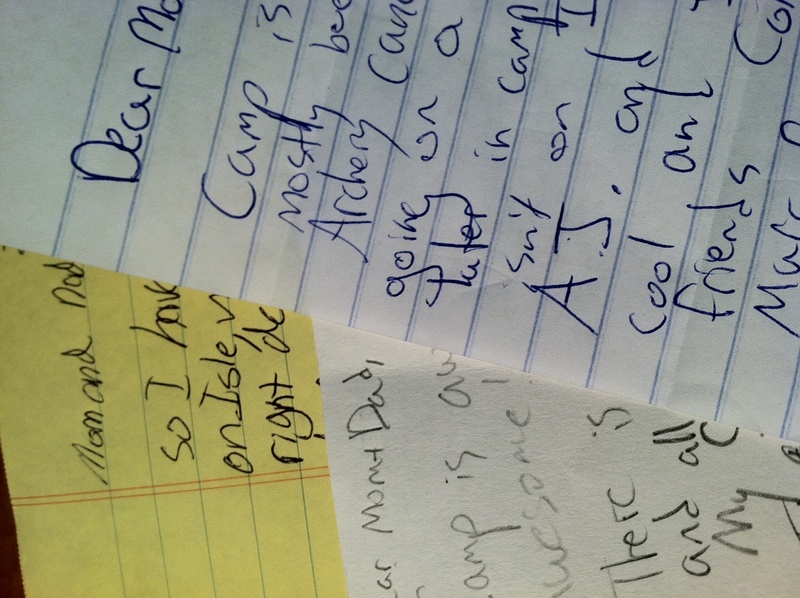 I have learned, over the years, that the grumpy letter written at camp on Tuesday is usually out-of-date by the time I am reading it on Friday. Unlike emails, which all look the same and are fleeting, letters are unique and lasting. 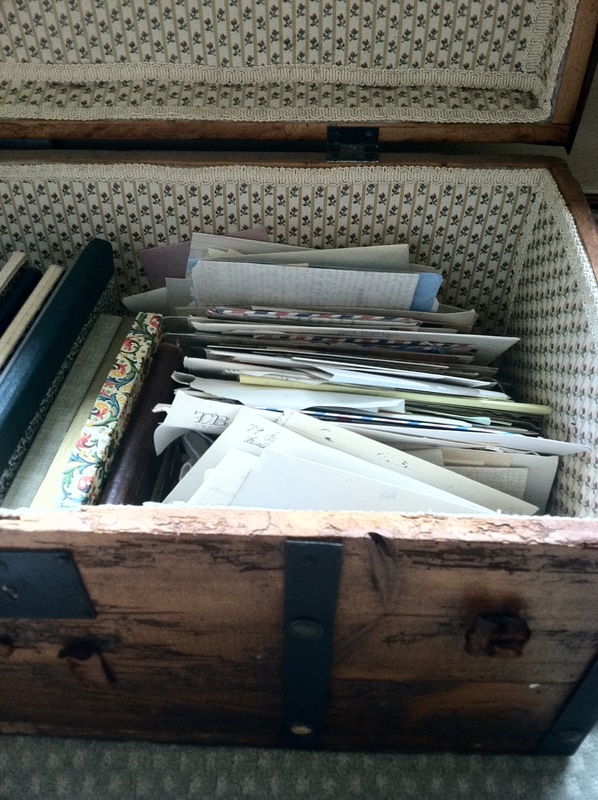 I have an old trunk full of letters written to me when I was at camp and at college and living abroad. I have letters written on onion-skin paper, on pages ripped from college notebooks and on light blue folded aerograms. I have love letters from old boyfriends and letters from friends I never thought I’d lose touch with. Every few years, I open the trunk and find myself sifting through the letters, slipping the pages out of faded envelopes and getting jolted by the sight of handwriting I once knew almost as well as my own. Not long ago, I read some letters from a friend from the years after college when I was single and working in publishing in New York. When I moved to Florida, we corresponded in long, hand-written letters. I was astonished by how much we had shared — about work and writing, romances, books and family — and how supportive we’d been to each other. How had I let that go? I contacted him and we renewed the friendship, which was nearly as easy as it had been decades before. When we met for lunch, I brought him a few of his letters. It was like giving him a piece of his past, reacquainting him with his very familiar but long-vanished younger self. Writing a letter is a more generous gesture than sending an email, which begs an immediate response. Letter writing is not really a conversation; it’s more of a duet. You take turns. I speak and you listen. Now you speak and I listen. And we each get to keep each other’s words, and read them again immediately or years later. There are so many good things about electronic communication that it’s no wonder that old-fashioned letter writing has fallen by the wayside. Whether it’s photographs of your kids, your new house or the swirling storm clouds you saw on the way to work; the funny thing you suddenly realized your best friend should have said to her difficult boss; the blog post that made you cry; or a quick message to your husband, how can you resist sharing it right away? I can’t help wondering, though, how much of it we’ll hold onto. I love this ode to handwritten letters – and while I am, admittedly, so very reliant on emails and texts, there’s nothing like a real letter. They’re almost romantic, aren’t they? They are romantic! You can’t scent an email with perfume, or kiss an email before sending it off. My mother saved the emails from the years I lived in Russia and while I’m sure that someday I will be glad to have them, they don’t beckon me as my trunk of letters does.